Morton’s, London’s exclusive, yet relaxed private members’ club, has been at the centre of Mayfair’s bustling social scene for 40 years. Once the private home of the Chancellor of the Exchequer, the Grade II listed building, with its basement nightclub and striking first floor restaurant, overlooks the length of Berkeley Square. Last month, its owners, husband and wife team Marlon and Nadya Abela, acquired The Square restaurant on Bruton Street. It is where we meet one half of this entrepreneurial duo, the effortlessly chic Russian-born Nadya, who couldn’t be happier with the way business is going. Nadya’s journey began at the University of Moscow, where after embarking on a course in psychology she moved to London to further her studies. But it wasn’t long before a model agency scout spotted her, and a prestigious fashion career spanning almost two decades quickly ensued. In 2014, Nadya decided to put her fashion experience to good use, launching the childrenswear brand, Roly Pony, with business partner Aytan Eldarova. Then, there is her admirable philanthropic side. Over the last ten years, Nadya has helped a number of charities across Russia. In 2015 she founded her own charity, Nadezda, which offers both medical help to children with various illnesses and disabilities as well as financial support for further education. I met Daniela Karnuts at a fundraising event for my charity Nadezda last year and we instantly hit it off. Her brand is only six seasons old but already she is considered by many as the go to brand for formalwear, given her use of stunning couture fabrics. All her garments, whether elevated daywear items or bespoke gowns, are made with love and care and are hand-sewn from start to finish. Despite her lack of formal training, Daniela was inspired by her mother and grandmother’s inherent sense of style, which really comes through in her timeless collections. Her gorgeous boutique on Brook Street is a haven of calm, inspiration and glamour for all those who visit. Founded in London in 1847, Bernard Quaritch sells rare books, manuscripts and photographs to private and institutional clients across the globe. Its specialist subjects include photography, science, travel, the fine arts, English and international literature, Islamic and European manuscripts, and early printed books. Current items include a first edition of Marx’s works and Soviet verses for children. I love going in there – it is like travelling back in time. The staff are always so happy to offer advice. Even if I’m not looking for something specific in mind, often I always leave with something tucked under my arm. I always love visiting Sotheby’s on Bond Street (as well as when I’m in NYC), for an insight into the some of the world’s most exciting collectables. It always has eye-catching window displays, which draw you in as you walk by. I have often made time to look at a specific sale item ahead of an auction and have ended up spending two hours lost in a world of history and antiquity. As one of the oldest auction houses, I love how Sotheby’s maintains its heritage yet translates it across digital media. I always check its Instagram feed to see what is going on and love the videos it posts on Facebook, especially featuring the collectors themselves. It was my husband who first introduced me to the fashion designer Hussein Chalayan, who has since become a friend. My husband is passionate about art and we both love Hussein’s approach to art and design. The Chalayan brand is celebrated for innovation and the ability to push boundaries through its seasonal shows and museum exhibitions. The collections offer alternative, yet timeless design, that intrigue and excite without compromising on precision or tailoring. Chalayan’s first London boutique is located on Bourdon Street, right behind Morton’s Club and we have hosted a number of events with Hussein, including a private presentation of the Spring/Summer 2016 collection and an insightful interview hosted by the contemporary art and design specialist, Andrée Cooke. Cartier has long been a favourite jewellery brand of mine. From its pens to the unique and priceless showpieces – each one makes a statement in its own way. My mother-in-law has long been a collector and together we share an admiration for the craftsmanship that goes into the fine jewellery creations as well as more simple and elegant pieces. I chose Cartier for one of my most precious pieces – my wedding band. I love the Bond Street store, especially its first floor showroom. I once hosted an event there for the launch of its L’Odyssée de Cartier collection, where a dozen ladies enjoyed éclairs from Marc Patisserie in-between trying on the breathtaking colourful creations. 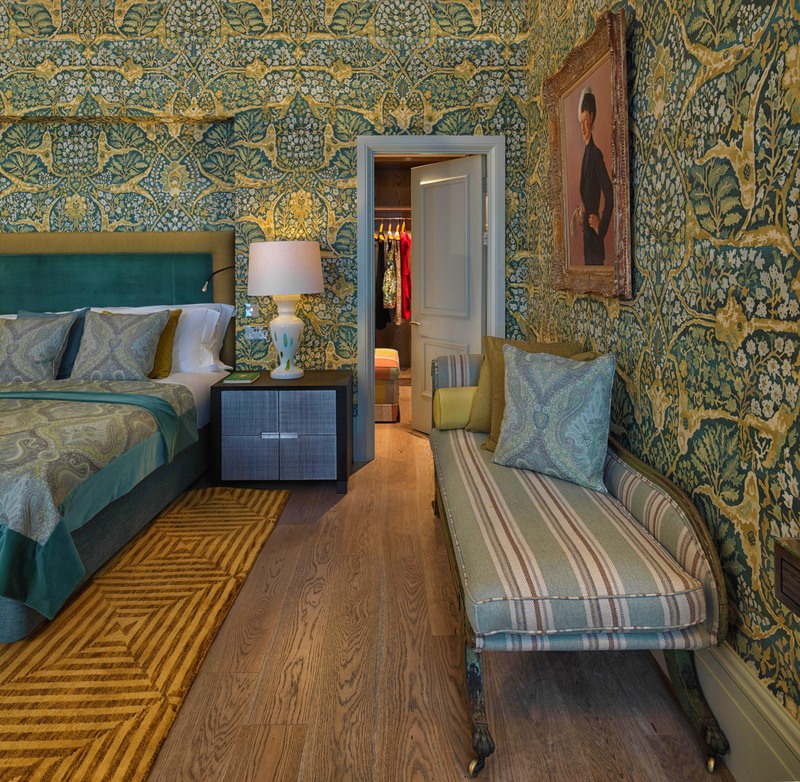 As April showers abound, here inside Brown’s Hotel’s new Kipling Suite at least, it’s a much brighter story. Rudyard Kipling is believed to have penned The Jungle Book on one of his many stays at the hotel. 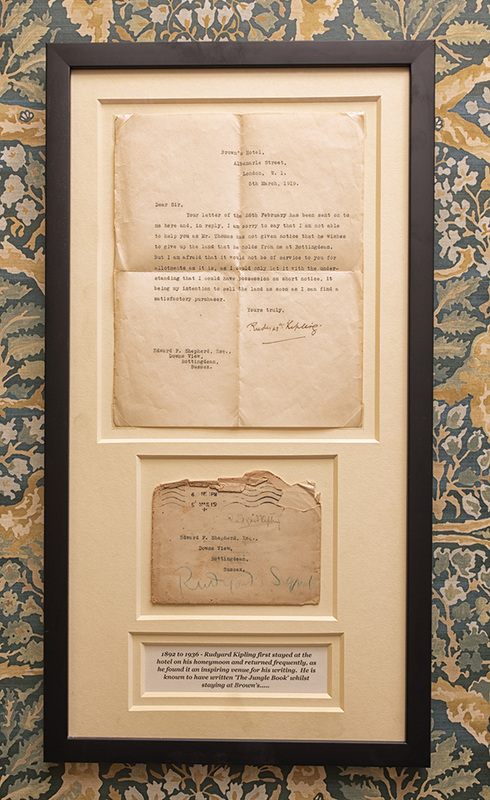 There’s a framed handwritten letter hanging in the suite’s hallway to prove he was a guest. And with its leafy Lewis & Wood décor and white resin monkey suspended by one arm above the front door, it’s hard to miss the subtle jungle theme running throughout. 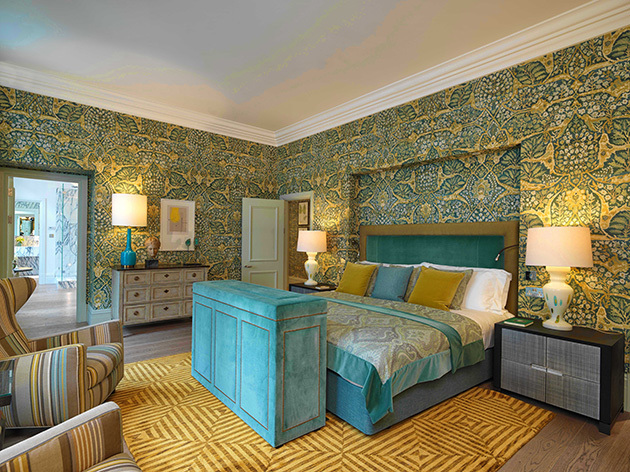 As the largest guest suite in the hotel, this plush home-from-home – a merger between the previous Kipling Suite and the Albemarle Suite – is yet another stroke of genius on the part of designer and hotelier, Olga Polizzi. 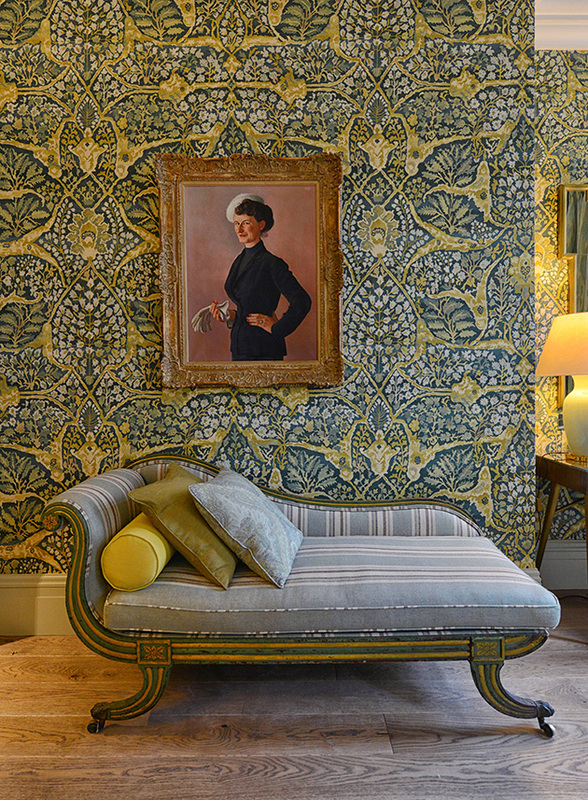 Together with her team, she has designed a new entrance lobby for the suite, which leads into the bedroom and capacious Kipling sitting room. 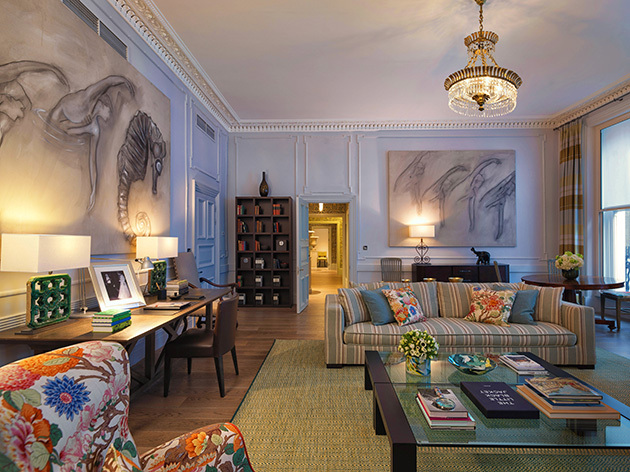 The weighty silk curtains designed by Manuel Canovas are drawn to reveal floor-to-ceiling windows with views over bustling Albemarle Street below. Not that you would know it though. From inside, you can almost hear a pin drop. Many of Polizzi’s unique finds result from her trawls around Sussex antiques shops. 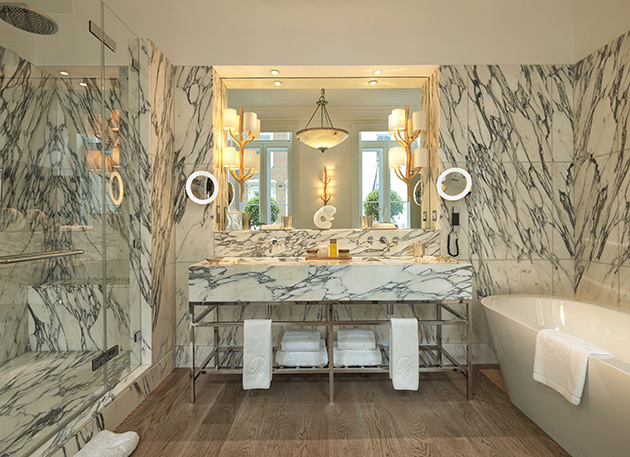 Take the stunning 1940s alabaster pendant lights, which hang in the lobby and bathroom, for example. She is said to have bought them for a snip from an antique dealer in the Sussex town of Lewes. But I probably shouldn’t be telling as it also happens to be is a place I go myself – or, take the odd London friend to – in search of unique home treasures. Oh well, bang goes that secret! Meanwhile, The Kipling Suite bathroom boasts a range of bespoke, organic skincare and bath oil by Spiezia Organics. Spiezia founder Amanda Barlow tells me that hers is the first company in the UK to gain 100 per cent organic certification across its entire range. There are other novel perks for guests staying here. The bookish can enjoy a personalised tour of Peter Harrington Rare Books on neighbouring Dover Street, which incidentally, holds a first edition of The Jungle Book. Or they can partake in a personal Bloody Mary masterclass, which is hosted in the celebrated Donovan Bar. I’m sure many a late night Kipling discussion or poetry recital will result from this. But for me, perhaps the best part of this magnificent suite was saved until last. As I walk through the bedroom, I discover a gloriously large walk-in wardrobe with separate ‘his’ and ‘hers’ hanging space and a central ottoman. Quoting from the great Kipling himself, I find myself muttering the word ‘If’ on my way out. ‘If’ as in ‘If-only-I-had-one-of these-at-home! Ah… la dolce vita! Cast your mind back in time to Rome’s Cinecittà heyday, to the Fifties and Sixties, when leading ladies; Elizabeth Taylor, Sophia Loren and Monica Vitti were snapped on the red carpet dazzling in Bulgari jewels. 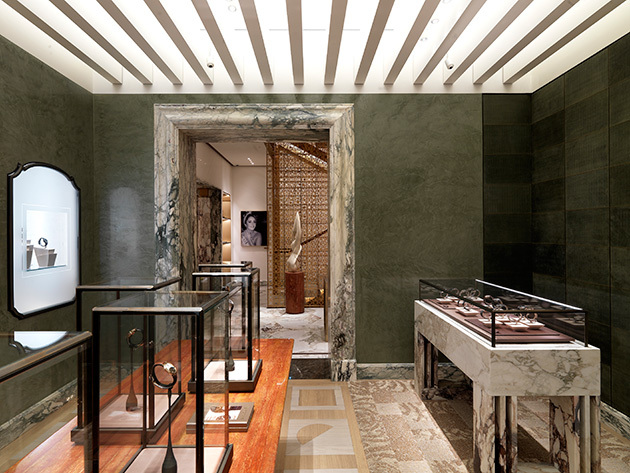 Fast forward to 2016, when this month a whole new flock of famous faces will be primed to celebrate the official opening of Bulgari’s redesigned New Bond Street store. 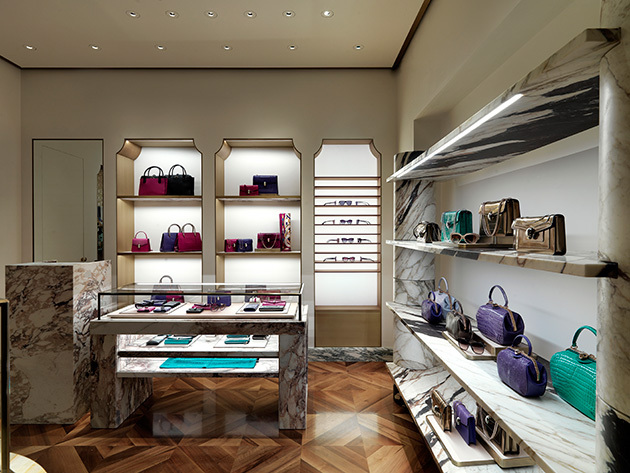 Designed by fashion’s favourite architect, Peter Marino, the new-look London store echoes many of the interior touches from Bulgari’s celebrated Via Condotti flagship – also revamped by Marino in 2014. For the London refresh, Marino draws inspiration from Bulgari’s Roman roots, with an emphasis on Italian classism interpreted in English architecture. As a result, Corinthian columns and vaults inspired by the 18th Century British architect Sir John Soane abound. On arrival, I’m struck by the stunning white Lasa marble mosaic floor and an overwhelming sense of openness and light. 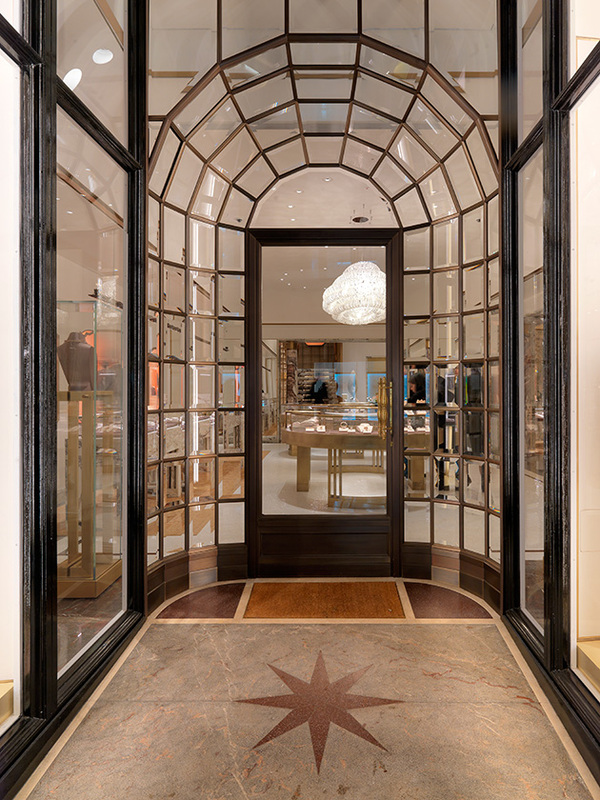 The entrance room features oval-shaped counters made from light, galvanized iron containing an array of twinkling Bulgari watches and jewels. Vast open-plan spaces housing the latest women’s jewellery and watches lines as well as signature men’s timepieces all lead off from here, rather like rooms in a luxurious penthouse. 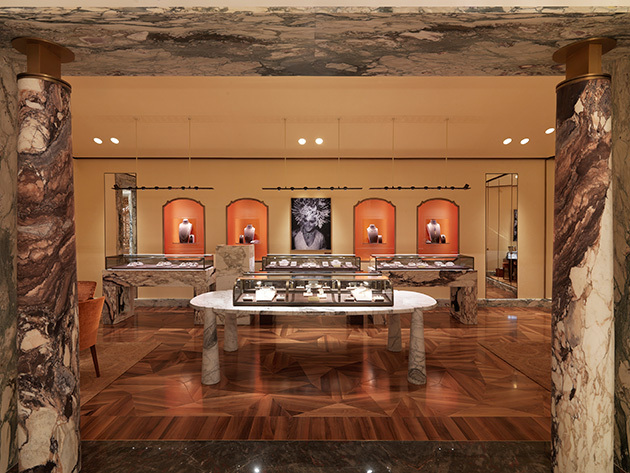 The ground floor also boasts a dedicated VIP area, based on the original Elizabeth Taylor lounge, Il Salottino Taylor, in Bulgari’s Via Condotti store. I’m told she would often take refuge there from the paparazzi and no doubt surround herself with the latest jewels. The New Bond Street version of this room has a notable Sixties vibe, with vintage armchairs, onyx coffee tables and plush carpets. I especially like the black and white portrait photographs featuring Liz alone or with Richard Burton, which hang here. The men’s watch area, meanwhile, has all the allure of a 1960’s gentlemen’s club with textured green suede walls and soft furnishings. Elsewhere, circles and square patterns from the Pantheon’s floor in Rome can be seen in the checkerboard floor pattern and the bronze latticework, which surround the impressive cantilever staircase. 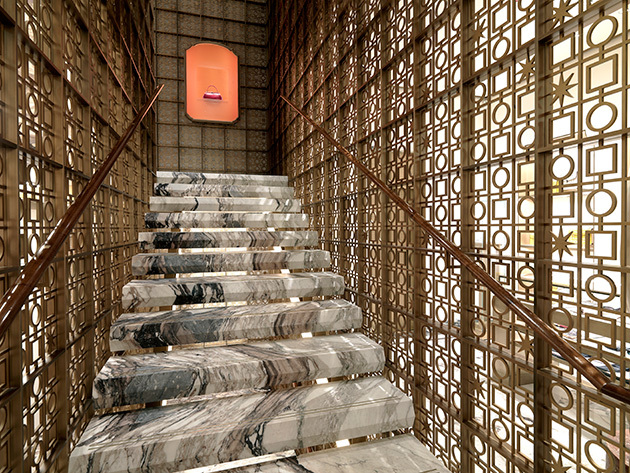 The mottled veins of the Italian marble steps, lead the eye up the stairs to the accessories and perfume collections, two VIP lounges and a luxurious room, designed to host parties and events. After the short climb, I stop to peer into glass wall cabinets containing rare diamond cuffs, necklaces and earrings. I also spy a large photo of Monica Vitti wearing the famous 1961 ‘Seven Wonders’ necklace, composed of seven large Columbian emeralds. And directly above, a huge skylight illuminates the entire floor. Aside from the newly revamped store, a major revitalisation of the brand can also be seen in its collections. As a result, Bulgari is trailblazing the way again with design-driven pieces such the new Diva Collection and B.Zero1 rings, aimed at a younger clientele. Bulgari is also putting the spotlight back on its iconic Serpenti collection, the snake-like wraparound bracelets and necklaces first designed by Giorgio Bulgari back in the Forties. This year, its portfolio of designs has been expanded to include a new line of jewellery and a watch. Looking ahead, Reyner says he has high hopes for the New Bond Street showcase. 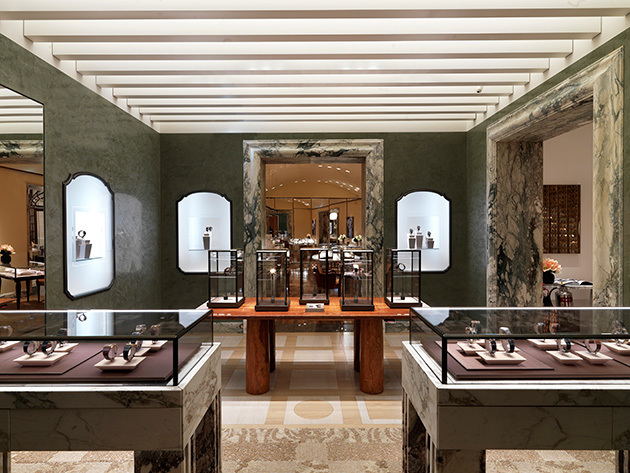 “We want our customers to see Bulgari as a place where things happen – a place you go to for more than a ring, for the experience as well as for something you aspire to.” As for the ultimate luxury experience, there is talk of running fine jewellery masterclasses (by private invitation only), at the store. Here, clients will be shown how to pair coloured gemstones and create fine jewellery pieces of their own. Sounds like a brilliant idea to me. William & Son’s first in-house designed handbag collection is brimming with contemporary colours and modern detailing. 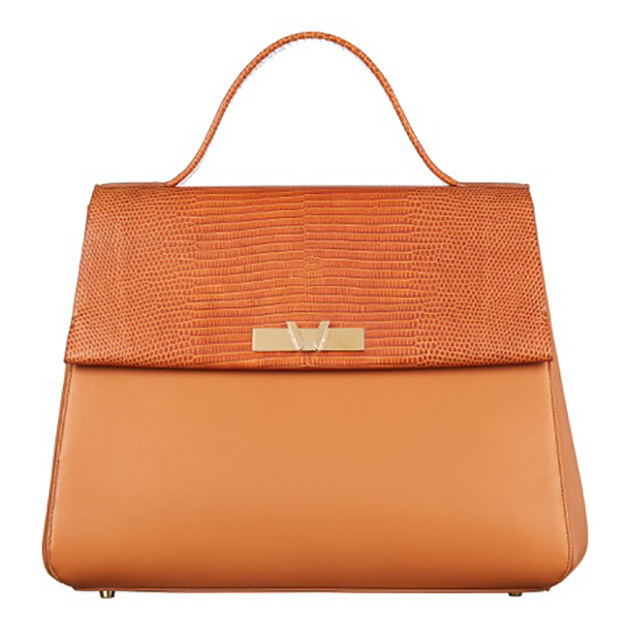 This timeless classic (£2,220) from the Bruton Collection with its shiny W-shaped hardware is a case in point. Crafted from tan lizard and tan calfskin leather using the supplest skins from a Florentine tannery, it takes its name from the street on which William & Son’s Mayfair flagship is located. Practical features include an inside zip pocket and detachable shoulder strap. Whether you wear it over the shoulder or carry it by the top handle, in true ladylike fashion, is down to you.